With the holidays fast approaching, sharing a scrumptious dessert recipe felt like the right move. My good friend Jenny Carr just released her anti-inflammatory cookbook, Peace of Cake. I've enjoyed Jenny's super yummy treats for years and was thrilled to learn she was making her recipes public with her book. As a (mostly) healthy eater, I really appreciate her angle. She shares food swaps that allow you to change out what you might be used to (the less healthy version) to healthy alternatives that don't compromise taste. It's brilliant! 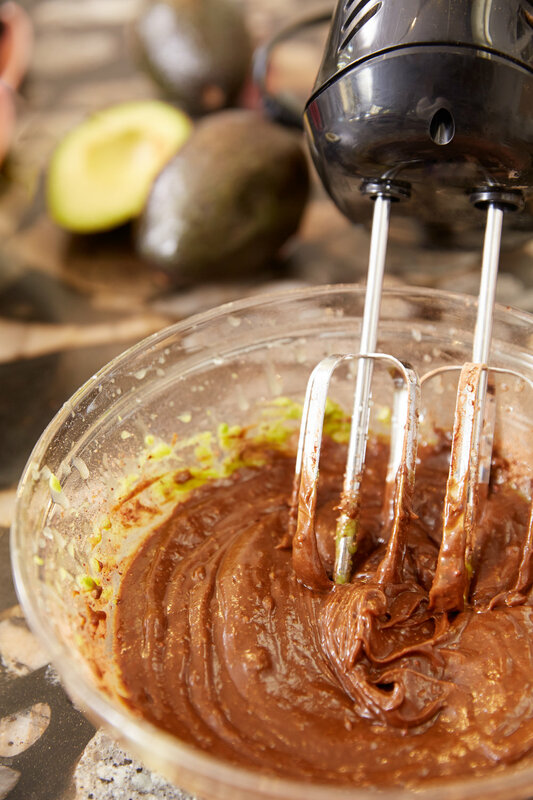 To celebrate the launch of Jenny's book, we got together with Lindsay Linton to capture the making of one of my favorite recipes from her book: Vanilla Cupcakes with Creamy Avocado and Cacao Frosting. Making the cupcakes was easy and fun, and I have no shame admitting I ate two in a row once they were done. If you have an upcoming party that you are either hosting or attending, these sweet treats will be a wonderful addition. Be sure to check out Jenny's book for more healthy recipes (especially if you have little ones you want to eat better) including breakfast, lunch and dinner, snacks, and of course dessert. One more thing I want to mention is how healing this book can be. If you or someone close to you has ever battled health issues, choosing an anti-inflammatory diet could be a huge help. Jenny bravely shares her own and her children's health challenges and how she found her way to making food for her family that was healing and supportive of their natural immune system response. Food is medicine. I truly believe that, and Jenny's book is an incredible and tasty guide to incorporating this knowledge into the every day. Okay, now for the recipe! Follow along below. 1. Make the Cake Batter. In a food processor, combine coconut flour, salt, and baking soda. Add eggs, coconut oil, maple syrup, and vanilla. Line a cupcake pan with 12 paper liners and scoop ¼ cup into each. Bake at 350 degrees for 20-24 minutes. Cool for 1 hour. Process all ingredients in a food processor (or high quality blender) until smooth. Let the frosting cool for a few minutes before icing the cupcakes. Jenny Carr is an anti-inflammatory health coach, a motivational speaker, a mom and an international best selling author of the book Peace Of Cake: The Secret To An Anti-Inflammatory Diet. She went through a near death experience due to chronic illness and survived, by walking her talk in regards to anti-inflammatory living. Jenny specializes in helping people reverse chronic symptoms through anti-inflammatory eating without feeling deprived or overwhelmed. Visit: Jenny-Carr.com to download your FREE copy of her new book, Peace of Cake.